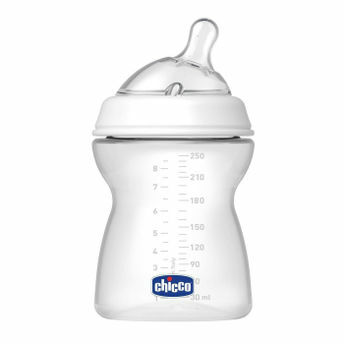 Chicco's Natural Feeling feeding bottles are made in Italy. Specifically designed for newborns, these bottles remain filled with milk, reducing the colics and any swallowing of air. It also encourages the correct neck position. This clinically tested bottle comes with extra soft silicone as natural as mother's breast.The medium flow ensures steady expression of milk.Wide opening fast to fill and easy to clean. Natural feeling feeding bottles are easily accepted by babies ensuring maximum comfort.